We’re delighted you’ll be joining us here at Concordia Supply. We look forward to continuing to support and serve your church and ministry with the supplies and service you deserve and expect. We want to give you a warm welcome and provide you with a smooth transition. Both Owners of Concordia Supply (Steve Belko), and Victory Church Products (Mark Muir) are proud to announce this new exciting change. We are working to make this transition as easy and seamless as possible for you. All shopping must now be done on concordiasupply.com We think you will enjoy our easy-to-use website with thousands of products available to purchase. You will continue to receive regular email messaging and seasonal print catalogs. We do catalog mailings for Fall-Christmas and Spring-Easter. Please Call our customer service team with any questions you may have. We also provided some FAQ's below. Since 1949, it has been our mission to inspire, equip, and serve the Church. Concordia Supply is committed to serving the local church with high quality church supplies and ministry materials. We strive to serve church and ministry leaders like you, with resources that honor God and help you make an eternal impact. We have a customer-first focus and will continue to dedicate ourselves to providing you with the products, support, and inspiration you need to thrive in your ministry area. Enjoy an improved shopping experience with Concordia Supply! a quality, easy-to-use website with thousands of products available to view and purchase. a team of experts ready to offer help and advice over the phone and online. work with our Design Team to create fully-customized products for your church or ministry. available for all orders over $75, every day! your go-to source for VBS Starter Kits, supplies, resources, and exclusive VBS tips and offers. We will always do what it takes to make it right. What can I expect during this transition? For the most part you can expect business as usual, your account has been transitioned over to ConcordiaSupply.com and you can begin shopping online or call in your order. You can also expect our Customer Service to welcome you and guide you each step of the way. We’re glad to serve you! How will I benefit from this transition? We believe you will enjoy the shopping experience on ConcordiaSupply.com. We go to great lengths to continually improve the user experience, product selection, and work to provide quality products at competitive prices. Will my Victory account become a Concordia Supply Account? Yes it will! We have made this happen already. Your email login, customer number, and information has already been transitioned. What if I already had an account with both Concordia Supply and Victory Church Products? If you have an account on both sites with the same email, we will merge those accounts into the ConcordiaSupply.com account. You can then continue shopping with your email and password from Concordia Supply or simply reset password if unknown. Note: We will also be emailing you specifically if this is the case and you are affected. Can I continue shopping on Victory Church Products site? How will the online shopping experience change? We believe you will find the shopping experience to be improved. You will find 95% of the same product at comparable or even lower prices. Plus we offer everyday Free Shipping over $75, 100% Satisfaction, Church Account billing by invoice, and other promotional offers throughout the seasons. Will prices be the same? You will find pricing of products to be almost identical and comparable. In some cases prices may be slightly higher, in others they will be even slightly lower. If you have pricing concerns on a particular product you have purchased in the past, we may be able to accommodate, please contact our Customer Service team. The top 95% of products you will find available on our site, there will be certain products that may not be available. However, almost all commonly purchases will be available. Will I still receive a physical mailed product catalog? Yes! In fact you have likely been sent one already. We send seasonal catalogs for Fall/Christmas, Spring/Easter, and VBS. These catalogs will have very similar product offerings to Victory Church Products. We believe you will enjoy the layout and design of our catalogs. We take great pride and effort in producing high quality catalogs for our church customers. Will I still receive promotional emails? Yes, you will likely have already been sent an introductory email from Concordia Supply. We make it easy to sign up and/or unsubscribe at any time. We have email lists you can join for special offers in the church supply and/or children ministry areas. We think you will enjoy the content and offers we provide through our email campaigns. How can I pay old open Invoices? We have transitioned all open invoices and you can pay those via your online account, or call. We recommend calling if you are having any trouble accessing your online account. Can I see my past order history with Victory in my online Concordia account? Not yet, We are currently working to bring past orders into the My Account area. We expect this to happen with 1-2 months. If you have a question about a past order please call our team who can help you with this information. What types of products and services does Concordia Supply have that is different? We offer the best in church supplies and Children Ministry. We are the leader in VBS materials and support. We also have an in-house professional graphic design team that can help you with customer banners, print pieces, shirts, and custom offering envelopes. Can you tell me more about Concordia Supply? Yes, of course! Concordia Supply has been serving churches since 1949. Starting from humble beginning as a local Christian bookstore, we now serve close to 100,000 customers annually. Our primary focus is serving church and ministry leaders. We value the work of the local church as well as support overseas mission efforts around the world. Learn more about us here. Why is Victory Church Products joining Concordia Supply? Mark Muir (Owner of Victory) has taken great care to serve his church customers over the years. As Mark was looking ahead to serving the Kingdom in another capacity and for someone to continue operating his business, he reached out to Steve Belko at Concordia Supply. Both companies share similar values in serving the local church and operate in similar ways. 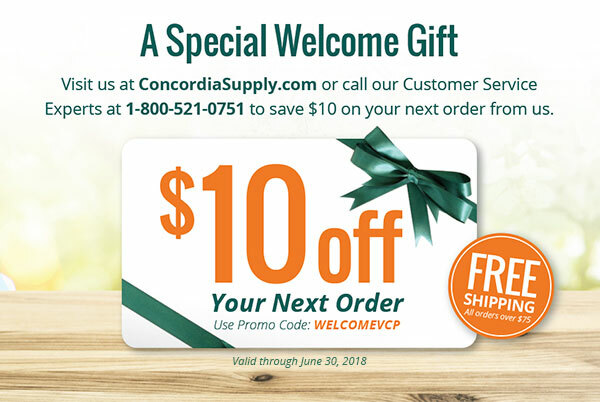 Concordia Supply is uniquely positioned to immediately and adequately serve Victory Church customers with high quality customer service and products. Where is Concordia Supply located? Our primary office and warehouse is located in Rancho Cucamonga, CA. We ship most orders out the same day they are placed. We also ship orders from several other warehouses around the country depending on the type of product being ordered to provide the fastest service possible.